h3knix was a small desktop distribution. It provides a custom package management system called "capsules". Capsules can install source or binary packages, and/or configure certain aspects of the system. h3knix offers great performance and good system stability. 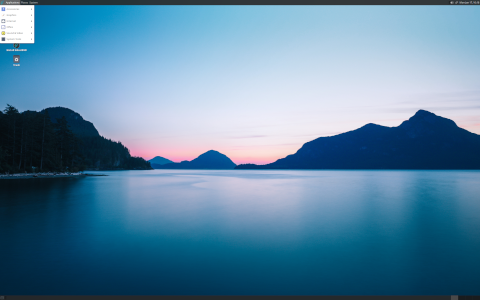 Rate this project GhostBSD is a rolling release TrueOS-based desktop operating system which features the MATE desktop (a community edition that offers the Xfce desktop is also available). The project's latest release is GhostBSD 19.04: "Finally, GhostBSD 19.04 is out! GhostBSD 19.04 has several improvements from the volume controller to the installer, and for the first time, we did add and change some code on the base system. GhostBSD 19.04 is available with our official MATE desktop including the community Xfce desktop iso. This release is a significant improvement from GhostBSD 18.12 enjoy. What has changed since 18.12: Replaced slim by LightDM; updated the system to FreeBSD 13.0-CURRENT; added the supports of ZFS with MBR on the installer; removed TrueOS setting to default to ZFS which improved the installation of UFS; fix default mate-terminal setting; Added GhostBSD boot mute; added Refine setup on the installer; removed gksu; fixed UnicodeDecodeError: 'ascii' problem with Software Station." Further details can be found in the project's release announcement. Download (SHA256) (pkglist): GhostBSD19.04.iso (2,694MB, torrent), GhostBSD19.04-XFCE.iso (2,554MB, torrent). Also available from OSDisc. GhostBSD is a rolling-release desktop operating system based on TrueOS, which is in turn based on FreeBSD's development (-CURRENT) branch. The project has published an update to GhostBSD 18.10, GhostBSD 18.12, which includes a number of updates and which replaces the Oktopkg graphical package manager with Software Station 0.3, a new pkgng-using software manager developed in-house. The new release also comes with updated versions of FFmpeg (4.1), Firefox (64.0), GStreamer (1.14.4), PulseAudio (12.2) and Thunderbird (60.3.3), among others. "GhostBSD 18.12 is an updated ISO image of GhostBSD 18.10 with some little changes to the live DVD/USB and with updated packages. What has changed since 18.10: removed default call of kernel modules for AMD and Intel processors; replaced Octopkg by Software Station; added back gop hacks to the live system; added ghostbsd-drivers and ghostbsd-utils; we updated the packages to the latest builds." The project's release announcement offers upgrade instructions for existing users along with screenshots of the operating system's MATE desktop environment. Download the latest version of GhostBSD from the project's download server: GhostBSD18.12.iso (2,592MB, SHA256, torrent, pkglist). The GhostBSD team have announced a new release, GhostBSD 18.10, which is the first stable version from the project to use TrueOS instead of FreeBSD as the operating system's base. The new version also adopts LibreSSL over OpenSSL, removes the GRUB boot loader in favour of FreeBSD's loader and the operating system uses ZFS as the default file system. "GhostBSD 18.10 is our first official release of GhostBSD with TrueOS under the hood and the official desktop is MATE. What has changed since 11.1: GhostBSD is now built from TrueOS instead of FreeBSD; OpenRC is GhostBSD main init system; LibreSSL is the default SSL; GhostBSD base system can now be upgraded to the next release via TrueOS packages base; we removed GRUB from the ISO in favor of the new FreeBSD hybrid loader; NetworkMgr now supports the option to manage multiple network card connection; Unionfs was removed from the live session; the live system has been rewritten to fix many issues; GhostBSD boots directly to MATE session; GhostBSD supports ZFS BE by default; FreeBSD ports and packages are incompatible with GhostBSD 18.10; GhostBSD uses TrueOS ports to build packages; drm-next-kmod was added for newer AMD and Intel cards; NVIDIA driver 390.87 was added to support the latest NVIDIA cards...." Further information can be found in the release announcement. Download: GhostBSD18.10.iso (2,615MB, SHA256, torrent, pkglist). The GhostBSD project develops a user-friendly, desktop-oriented flavour of the FreeBSD family. Past versions of the operating system were based on FreeBSD, but the project's new release candidate, GhostBSD 18.10 RC1, is based on TrueOS. "This first release candidate of GhostBSD 18.10 is the first official release of GhostBSD with TrueOS under the hood. The official desktop of GhostBSD is MATE, in the future there might be some community release like XFCE, but for there is no community release yet. What has changed since 11.1: GhostBSD is now built from TrueOS instead of FreeBSD. OpenRC is our main init system. LibreSSL is in base. GhostBSD base system can now be upgraded to the next release via TrueOS packages base. We removed GRUB from the ISO in favor of the new FreeBSD hybrid loader. NetworkMgr now supports the option to manage multiple network card connection. Unionfs was removed from the live session. The live system has been rewritten to fix many issues. GhostBSD boots directly to MATE session. GhostBSD supports ZFS BE by default. FreeBSD ports and packages are incompatible with GhostBSD 18.10. GhostBSD uses TrueOS ports to build packages." Further information and screenshots can be found in the project's release announcement. Download: GhostBSD18.10-RC1.iso (2,535MB, SHA256, torrent, pkglist). GhostBSD is an easy to use, FreeBSD-based desktop operating system. The project has released GhostBSD 11.1 which is available in MATE and Xfce flavours. The new version features easy ZFS configuration the Whisker Menu for the Xfce edition, keyboard layout fixes and an independent GhostBSD software repository. "After a year of development, testing, debugging and working on our software package repository, we are pleased to announce the release of GhostBSD 11.1 is now available on 64-bit (amd64) architecture with MATE and Xfce desktop on direct and torrent download. With 11.1 we drop 32-bit i386 support, and we currently maintain our software packages repository for more stability. What's new on GhostBSD 11.1: GhostBSD software repository. Support VMware Workstation Guest Features. New UFS full disk mirroring option on the installer. New UFS full disk MBR and GPT option on the installer. New UFS full disk swap size option on the installer. Whisker Menu as default Application menu on Xfce. All software developed by GhostBSD is now getting updated." Further details can be found in the project's release announcement. Download (pkglist): GhostBSD11.1-mate-amd64.iso (2,397MB, SHA256, torrent), GhostBSD11.1-xfce-amd64.iso (2,267MB, SHA256, torrent). GhostBSD is a desktop-oriented operating system based on FreeBSD. The project has published a new release candidate for the 11.1 series, GhostBSD 11.1-RC1. The new development snapshot removes GRUB from the system installer to prevent a number of bugs and ZFS volume configuration has been updated. "This last development release of GhostBSD 11.1 is ready for testing. All MATE and Xfce images are available only for 64-bit architectures. For some of you, it might be shock that we are dropping i386 it is a decision that was hard to make. We hope for those that need i386 will find refuge to another BSD project. On this RC release, we need help to find more problems. GhostBSD 11.1 is our first release featuring our own software package repository. What changed in 11.1 RC1: We removed GRUB from the installer for 11.1 as it has caused us a lot of problems, and this is why the release is late; ZFS configuration. Issues that got fixed: The partition list was not deleted when pressing back; the installer was not listing ZFS disk correctly." The release announcement invites people testing GhostBSD to report bugs. Download (pkglist): GhostBSD11.1-RC1-20171031-142739-mate-amd64.iso (2,398MB, SHA256), GhostBSD11.1-RC1-20171031-143943-xfce-amd64.iso (2,269MB, SHA256). The GhostBSD project develops a FreeBSD-based desktop operating system. The GhostBSD project has published a new beta snapshot based on FreeBSD 11.1 and is testing new support for VMware Workstation Guest Features. "This first beta of the development of GhostBSD 11.1 release is ready for testing. All MATE and Xfce image is available with i386 and amd64 architectures. We hope to see a lot of people helping to test this next release. New feature: support VMware Workstation Guest Features out-of-box. Issues that got fixed: locale setting not filling correctly; Update Station tray icon; Xfce GhostBSD build: pkg still bootstraps from pkg.freebsd.org instead of pkg.ghostbsd.org; Octopkg/new repo." Additional information on this beta release can be found in the project's release announcement. GhostBSD 11.1-BETA1 is available in MATE and Xfce editions. Download (pkglist): GhostBSD11.1-BETA1-20170829-182151-mate-amd64.iso (2,376MB, SHA256), GhostBSD11.1-BETA1-20170829-190242-xfce-amd64.iso (2,247MB, SHA256). Eric Turgeon has announced the availability of the initial alpha build of GhostBSD 11.1, an upcoming new release of the project's desktop-oriented operating system based on FreeBSD 11.1 and featuring MATE and Xfce environments: "This first alpha development release of GhostBSD 11.1 is ready for testing. All MATE and Xfce images are available for the i386 and amd64 architectures. We hope to see a lot of people helping to test this release. New features: our own software repository; all software updated; Whisker menu as default application menu in Xfce. Issues fixed: Xfce and MATE live session shutdown, suspend and hibernate; xf86-video-intel; MATE desktop fails on initial boot for install; clicking 'GhostBSD Bugs' item in the Main menu in 'System Tools' brings up 'Server not found' page; Xfce installation - incorrect keyboard layout; ZFS setup appears to be incomplete." Read the rest of the release announcement for more information. Download (pkglist): GhostBSD11.1-ALPHA1-mate-amd64.iso (2,396MB, SHA256), GhostBSD11.1-ALPHA1-xfce-amd64.iso (2,267MB, SHA256). The GhostBSD project produces a desktop-oriented operating system based on FreeBSD. The GhostBSD project has announced the availability of a new test release, GhostBSD 11.0-ALPHA1, which is based on FreeBSD 11. The new alpha snapshot includes the latest NVIDIA video drivers and introduces the Whisker Menu as the default application menu for the Xfce desktop. "GhostBSD 11.0 ALPHA1 is ready! This alpha release is ready for testing and to be use in production there will be no need to reinstall other development release of GhostBSD 11.0 since the update manger will push update of GhostBSD. All MATE and Xfce images are available with i386 and amd64 architectures. New features: Latest NVIDIA drivers installed by default; Whisker Menu as default application menu of Xfce." This alpha snapshot also includes a number of fixes for the Xfce desktop and one for ZFS, an advanced file system. Further details can be found in the project's release announcement. Download (pkglist): GhostBSD11.0-ALPHA1-mate-amd64.iso (1,961MB, SHA256), GhostBSD11.0-ALPHA1-xfce-amd64.iso (1,855MB, SHA256).